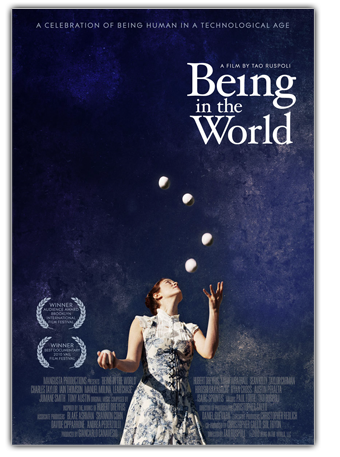 Next week, on Friday 7 June 2013 Birkbeck’s Centre for Media, Culture and Creative Practice will host a screening and discussion of Being in the World (Tao Ruspoli | USA | 2010 | 81’). Being in the World explores the intimate connections between skilful mastery and the ways in which humans beings find themselves in contact with objects in the world. The film highlights a series of personal stories (musicians, cooks, etc), which are interwoven with the insights of contemporary philosophers – namely Hubert Dreyfus and the phenomenologists that have followed in his wake – on the nature of ‘being human’ and the limits of technology. Being in the World will be screened in the superb Birkbeck Cinema. Not only is it an interesting and well-shot film, but it has strong connections with the Conditions of Mediation preconference, inviting a broader discussion focused on the relationships between human creativity and emergent digital technologies in particular. The film itself is self-consciously ‘a celebration of being human in a technological age’ but with the help of our discussants Paul Caplan and Justin McKeown, we hope to orchestrate a critical discussion of what being human might mean in an era many see as defined by intrinsic codependencies between humans and nonhuman objects and technologies. The screening will begin at 6pm, followed by a discussion until around 8.30pm. Wine and nibbles will follow.